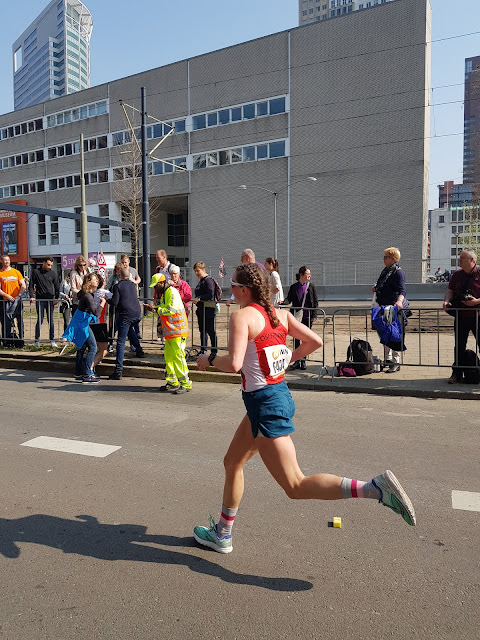 I was nearly at the start line of Rotterdam Marathon, and I had to pee. The lines for the port-a-potty had been too long, and I decided getting to right area of the field was more important than my bladder just now. I pushed my way through the crowds until I could see the 3 hour pacer in the distance, incredibly jealous of my male friends who could use the urinals. Pål found me in the crowd, after a visit to said urinal. There wasn’t much time until the gun went off now, barely any time for jumping up and down on one’s toeballs nervously. There was just enough time for him to turn to me and say, very seriously, “If you are on track to making sub 3, just pee yourself.” I nodded, knowing in my heart of hearts that sub 3 was entirely hypothetical. It’s easy to get caught up in the shiny allure of a nice, round time goal. After signing up for Rotterdam in October, I punched in my 10K PR into Jack Daniel’s VDOT calculator, and, BAM, the time 2:58 came out. The 3 hour barrier beckoned; could I do it? But marathon training humbled me. 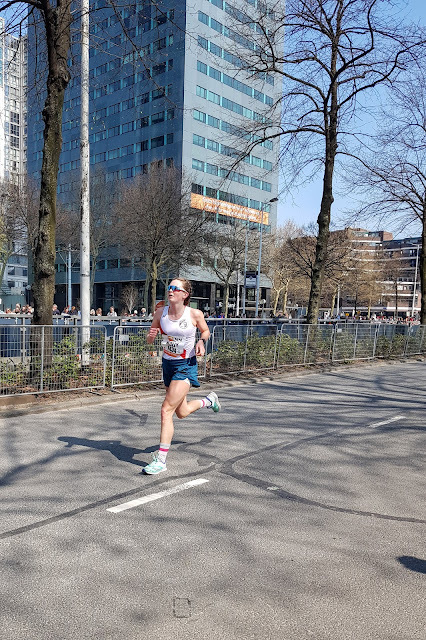 I simply could not complete sessions at the required pace, and soon realized that although the 3 hour wasn’t beyond the horizon of possibility, it was not going to happen in Rotterdam. So I changed my training, running marathon sessions at a slightly slower pace and reevaluated my goals. What I wanted was not just to run a marathon – I wanted to race it, to run hard from start to finish. But I didn’t want to start too hard either, so I set a goal of running less than a 2 minute positive split, that is, running the second half two minutes or less slower than the first half. My final goal was to face the pain. I hoped that when my legs started to tell me to slow, I could push through and carry on. Some people seemed disappointed when I wouldn’t say that I wanted to run sub 3 at Rotterdam. But letting go of the time goal and focusing on the process of racing a marathon freed me. I had less race nerves than I was used to, perhaps because I was at peace with my preparation. There would always be unknowns, but I was ready to face them. 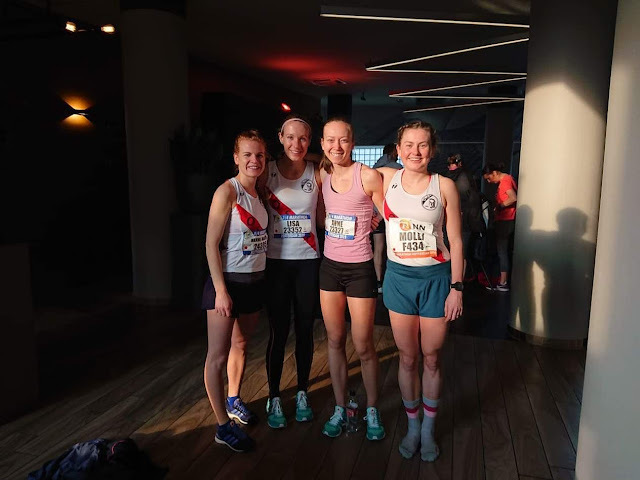 Pre-race with my OSI crew: Hanne Marthe, Lisa and Anne, who all ran blazing fast times at the quarter marathon. The field set off over the Erasmus bridge, a hard start to an otherwise flat course. I ran behind Pål, weaving through a crowd of people. It was impossible to gauge whether I was going too fast or too slow. I soon realized he was running harder than I wanted to go, and let him disappear into the crowd ahead of me. Despite the cool air temps, the sun was beating down and sweat soon dripped down my face. The first few kilometers clicked by in the process of finding my rhythm, constantly monitoring the pace on my watch. Buildings seemed to throw off my watch, so in the end I only really trusted the number that appeared when I pressed the lap button at every kilometer sign. The first water station came after 5K, the first unknown. It might sound trivial, but I hadn't been able to practice drinking from the cups they provide at marathons. Rotterdam uses a clever system of cutout sponges in every cup, and I quickly discovered I could drink a lot by slowing down just a tad and drinking in several sips. The course twisted and turned in the beginning, but soon the moving mass of marathon runners entered a long, straight bike path. We were out of the city now, surrounded by verdancy. The straightness was nice at first, but after a kilometer so the unchanging scenery grew monotonous. I can't believe we're only a quarter of the way through the race. Although I was running in a crowd of other runners, I hadn't really latched on to anyone. It was on the bike path I found the Tiny Woman. A full head and shoulders shorter than me, she wore a turquoise tank-top and ran with a long, loping stride. She looked relaxed, and as I fell into step I realized she was running very evenly at just the pace I wanted to go at. We continued in companionable silence, both breathing hard and focused on our own races, me pulling sometimes, then her. There were numerous music stations along the course, mostly charming marching bands, providing something to look at as the landscape passed by. A DJ station playing loud techno music at around 18K got my pulse racing, and before I knew it I was closing in on the half marathon. Halfway. The last half both easier, as you draw closer to the finish, and endlessly harder, as your fatigue mounts. I passed in 1:30:56. It would take a Herculean negative split to make sub 3 now. Soon afterwards, I saw a familiar OSI singlet and a curly head of hair I had not expected to catch - my friend Joost, who had been stronger than me at all of our joint marathon training sessions. "Are you OK?!" I asked, genuinely concerned. "Yeah, it's just not my day, I'm just going to jog to the finish," he replied dejectedly. Part of me wanted to try and convince him to latch on, to fight, to run with me to the finish, but I didn't have the energy to focus on anything other than my own race. You see, the Tiny Woman had begun to speed up. I matched her, step for step. We would split slightly in aid stations, downing our water and then finding each other in the masses again. Spectators were shouting our names as we passed. "Go Molly! Go Maria!" I felt like a rock star; maybe I could negative split? Maybe sub 3 was still a possibility? Around 26K, I realized there was still a long way to go, and that my effort level was a tad too high. Back off now, I thought, and you can sped up at 35 if you still have anything left in the tank. I let the Tiny Woman go, hoping that she would nail the rest of the race. The marathon passed over the Erasmus bridge a second time, and there was pulsating music blaring from speakers all along the bridge. The world around me was starting to feel blurry as the singular task of moving forward at the prescribed pace demanded my undivided attention. Just past the bridge, I saw my OSI friends, roaring my praise as I passed. I found myself speeding up as I passed them, hoping I looked fast and strong even though I was starting to fatigue. The next section, around the 30K mark, paralleled the 40K mark and I saw several of the elites passing, a full 10K ahead of me. I found myself envying how close they were to the finish. One more gel, two more aid stations. I was meticulous about drinking lots of water at all the aid stations, not wanting to succumb to dehydration in the heat of the day. At 34K, I passed screens showing video messages from my friends. I couldn't hear their words, but I could feel their energy. The finish line a meager 8K away, or an endless 35 minutes, close and far at the same time. And then. Came. The Wall. This time it came in the form of both of my quads locking, as though I had run thousands of meters of vert rather than pounded 35K of pavement. I saw the pace on my watch slowing. Push push push. I remembered, if not the exact words, the essence of Peter Bromka's inspiring essay: "The feeling that you are doing something terribly wrong? It means you're doing it right. This is your moment of full extension." I passed people running much slower than me. I passed people walking. I even passed a couple of people who had collapsed, ready to be carried out on stretchers. My friend Paul appeared in the crowd, and I barely had the energy to acknowledge him with a wave. He ran near me for a while. "Allez allez Molly Go go go!" he shouted. He must think I am going so slow, I thought. But this is all I have. Push push push. The devil on my shoulder told me to slow down, to jog to the finish. SHUT UP. Push push push. Every step jarred my shattered quads, and my pace slowed despite my effort, and time slowed with it. The line appeared in the distance and for the first time in my life there was no sprint in me; it was all I could muster to keep moving at the pace I was already going at. My pace had been right at the edge of reason all day. As for my goals? I ran as hard as I could from start to finish, and was absolutely destroyed at the finish line (and for the days afterwards). I ran about a 1 minute positive split. And when the wall came, I faced it. Full pot.